The two-part concert promises a spectacular fervor for the attendees. 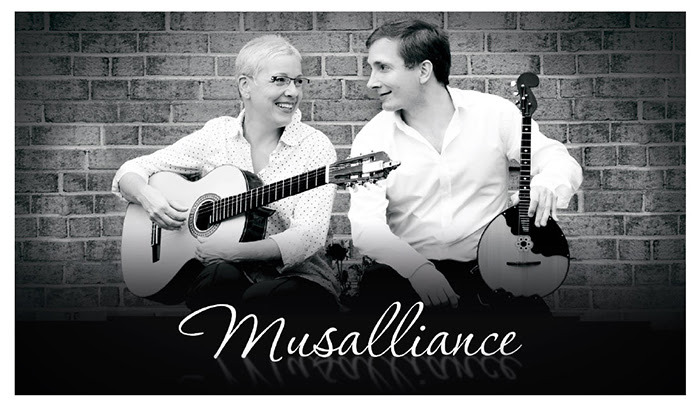 The first part will provide an opportunity to experience “MUsalliance” duo; an exciting new string duo offering a program of brilliant virtuoso interpretations of classical, international, folk favorites and more. Followed by an unforgettable performance by Tatyana Thulien (soprano, composer, poet, musician (guitar and piano). 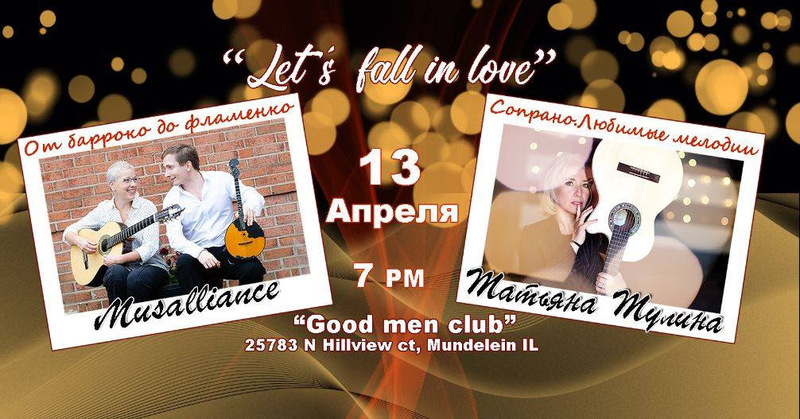 Anna Kusner (guitar), Peter Omelchenko (domra/mandolin). Who will offer classical masterpieces with their own arrangements never before performed on these instruments, such as compositions by Paganini, Shubert, Villa-Lobos, and Rimsky-Korsakov (his famous “Flight of the Bumblebee”). 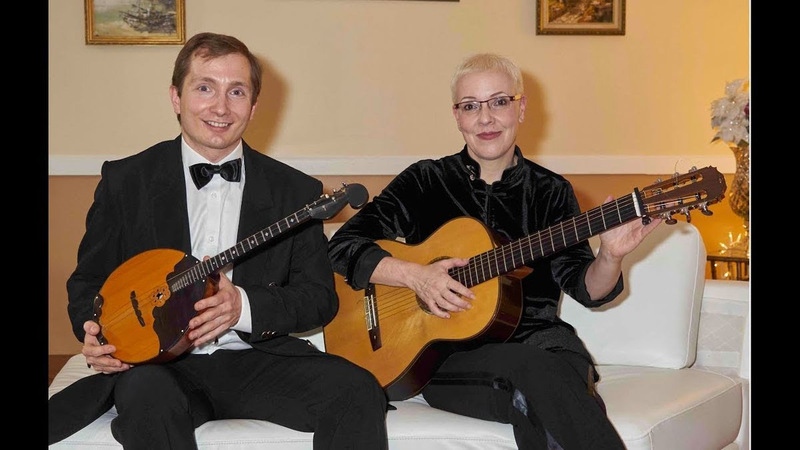 Peter Omelchenko (Domra) – graduated from the Gnessin Academy of Music in Russia, has performed with the Osipov Balalaika Orchestra, and plays and soloes with the Washington Balalaika Society Orchestra. His musical talents also include singing, arranging, composing, and teaching. Anna Kusner (Guitar) – graduated from the State Gnessin Music College in Moscow. In a duo with a Bolshoi Theater singer, she performed Russian art songs for several years at the Moscow Philharmonic Society. After graduating from the Academy of Music in Jerusalem in 1995, Anna performed with chamber orchestras and ensembles on Israeli TV, radio, and at music festivals. She has taught classical guitar widely, and has somehow found time to record 16 CDs. 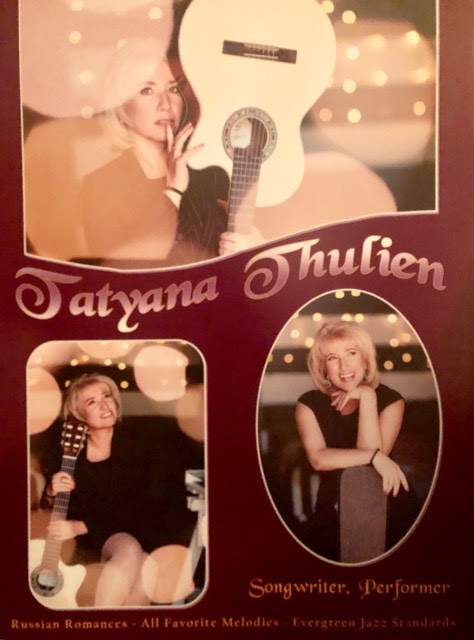 The second part of the concert will provide an opportunity to experience a truly gifted vocalist, composer, poet and musician, Tatyana Thulien. She will perform Classical Romance, Jazz hits such as, Summertime, The Autumn Leaves, All Of Me, Let’s Fall In Love (rarely heard), which inspired this concert’s name, as well as other hits from Ella Fitzgerald, including, Love For Sale, and Honeysuckle Rose. Likewise, melodies from well-known Russian cinema “Vam i ne snilocj”, “chelovek-amfibiya” and others. Tatyana Thulien (Татьяна Тулина) received her vocal training from the Crimean Chamber Singing School, master classes from the Kiev State Conservatory and series of jazz improvisation master classes. She appeared in the numerous performances including Sevastopol Drama Theater. Tatyana is a laureate of the Crimean Folk Music Festival Special Prize. She also is an established songwriter; for two consecutive years her songs (Ashes of Summer) were top of Crimean Music Hit Parade. Since moving to the U.S. (Minnesota), Tatyana participated in the number of concerts for the Russian-American audience (Russian Seasons of Minnesota 2002-2009, Minneapolis Sister Cities 2009-2010, Celebrating Russian Art, 2010). Tatyana has been a member of the Opera Carolina Chorus and appeared in 12 opera productions, including Aida, La Traviata, Flying Dutchman, Nabucco, Rome and Juliette, Lucia di Lammermoor, and others. For Info & Tickets call 224.628.2480 for more information!